to shut off collection if the tank gets too hot. storage I'm charging it with the flat plate. off wheen it rises to only LDB below the setpoint. > I'm using the large scale storage with 30 temperature levels of stratification. On the attachment you can see the temperature profile inside the TES. > The reason I'm trying to maintain low storage temperature is because the needed temperature to deliver into the residents is only around 60C. > I'm charging the buffer tank with the heat pump. And for the main storage I'm charging it with the flat plate. > are these connections correct? > Maintaining high energy gains while maintaining low temperatures is difficult unless you have great stratification and/or a very large storage. Why are you trying to maintaain low storage temperatures? > Are you charging the buffer with the heat pump or are you charging the main storage? Typically you'd use an aquastat that watcxhes the tank temperature and turns on/off the heat pump. > Thank you for your explanation. Actually, my main problem is with TES and I thought by controlling the inlet temperature of solar coll can help to maintain the low temperature of fluids inside the TES. So, I already got the right amount of TES energy gain to meet the demand, but the problem is the high temperature inside TES. I need to maintain the low temperature inside TES but also produce high energy gain. Do you have any suggestion what should I do? > I have another question still regarding SHW. I created another SHW simulation and it consists of solar coll, TES, heat pump, and buffer tank. The water to water heat pump (type 927) component acts as auxiliary heating when the heat from solar coll is not sufficient. 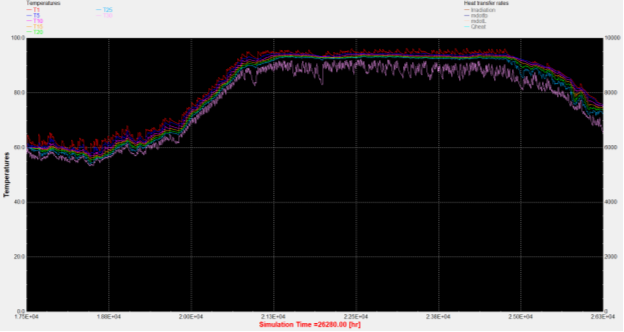 After I run the simulation, the heat pump works but the outlet temperature really high. I only need to increase the temperature from 40C to 60C but it goes up to 90C. What control should I apply for this problem?